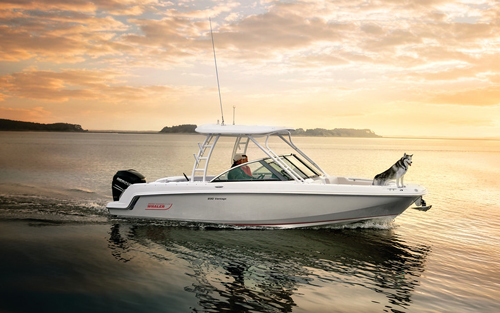 Featuring the latest in dual console design, combined with a smooth running deep V hull. 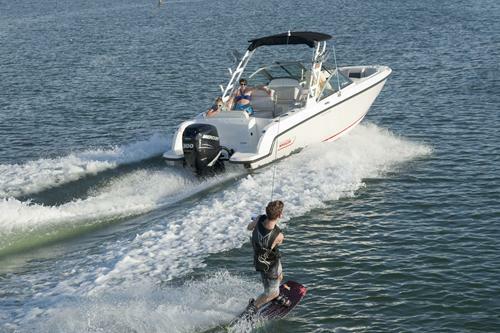 A multi-function boat that can be used for skiing, wake-boarding, fast commuting, family cruising, fishing or sunbathing. The wrap-around screens offer good protection from the wind. Convertible port side lounge seat. Sink with cutting board and 36 qt cooler box. Optional extras : Coloured hull £1332. Anchor windlass with thru-hull docking £3550. Watersports tower £4415. 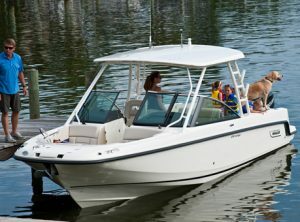 Bimini top for watersports tower £1754. 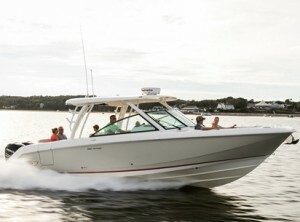 The fabulous new Boston Whaler 270 Vantage is available as a single or twin engine installation. Walk-through screen leading to a forward seating area for sunbathing or entertaining. Superb performance with a unique layout giving plenty of space for everyone. 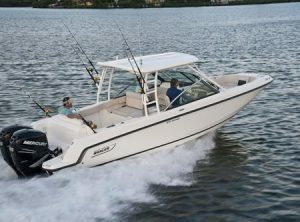 The 320 Vantage is proving to be amazingly versatile with superb performance!